Ted Warren is back with another installment of his English Workbook series. Now adding grades 6-8, this book is designed for students to establish their own grammatical concepts as they practice them. In addition, the teachers will want The Teacher's Manual for Three Workbooks to accompany. Building from the student's own experience promotes a deeper and more personal understanding of English grammar. The exercises in the book challenge the student to make their own example of the subject at hand. In a classroom setting, the exercises can be shared with others by writing or speaking, thus allowing a playful aspect to learning these sometimes difficult concepts. The workbook includes all of the Common Core requirements for these grades, but the author recommends only teaching what the student is able to absorb. Ted Warren is a dedicated Waldorf teacher focused on discovering effective ways to firmly implant knowledge in the minds of students. This Workbook is filled with the sort of content that can help homeschoolers and class teachers alike. 8 1/2" x 11", 168pp, 2017. 96 pages, 8 1/2"" x 11", 2015. This outstanding workbook is so beautifully conceived, with exercises that are so creative, engaging, and masterful in their ability to teach the basics of English grammar and syntax that I can only imagine parents, teachers and, yes, students cheering as they explore its pages. Accompanied by the information the teacher will bring from The Teacher's Manual for Three Workbooks, students will discover clear rules for punctuation, parts of speech, and spelling. They will also discover how exciting English can be and some of the many wonderful things one can do with it. Ted Warren is an experienced Waldorf teacher who has dedicated his life to discovering effective ways to us Waldorf methods to firmly implant knowledge in the minds of students. The Fourth Grade and Fifth Grade manuals are the beginning of a series, and this Workbook is filled with the sort of content for which homeschoolers and class teachers have been yearning. 96 pages, 8 1/2"" x 11", 2014. If you order this item it will be shipped in 1-2 weeks. Lavishly illustrated with every page in full color, this alphabet story from Reg Down is a delight to read for both children and adults alike. Filled with the humorous adventures of the gnomes Tom Nutcracker and June Berry as they learn their letters with the help of Tiptoes Lightly and friends. Whether your child knows their alphabet or not Pine Cone and Pepper Pot guarantee that they will see the letters and their shapes with new and creative eyes. The Alphabet is filled with stories, songs, pictures, plays and adventures silly and bold. Highly recommended!! 8 1/2" x 11", 90pp., 2016. A fascinating tale of discovery and of the richness of language, written and spoken! Adam and Sophia are twins. Sophia has wings and Adam doesn’t. One day their parents leave. “Don’t go into the forest,” they said, but Adam did - he gave his word and broke it. Now he is lost and alone, and his voice is gone. Sophia flies overhead and drops a piece of paper. It flutters into the forest. Except for a lock of hair the paper is blank. Immediately, adventures and experiences unfold for Adam, some common, some extraordinary, some unearthly and beautiful. Letters appear on the paper as Adam wakes up to his ‘alphabet’. Slowly, painfully, joyously Adam wins his word back. 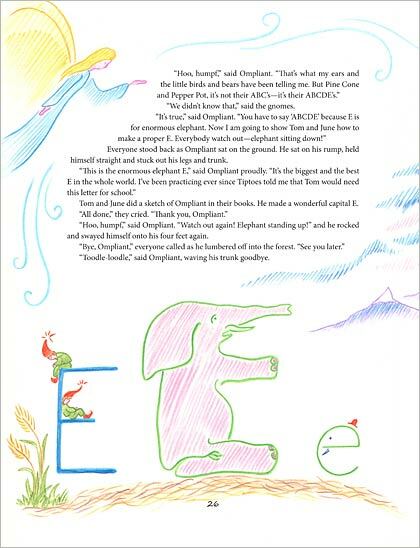 Adam’s Alphabet is an alphabet tale unlike any written before. Multilayered and broad, it reads as a children’s book, but underneath run deeper waters that adults can plumb for profit and pleasure if they take delight in the spoken word. LMNOP is a beautiful book which should be both an inspiration and an enormous help to everyone who has heard about the Waldorf approach to teaching the alphabet but has never witnessed it. It will also be inspiring to every teacher who has taught children with this approach but has not had a chance to observe many other teachers at work. In addition to an very valuable introductory essay which makes clear many things about this creative approach (and offers suggestions for variation and direction), each letter of the alphabet is presented with a full page drawing of luminous color and its own very special poem. The thought of even more children joyfully commencing their journey into the written word in this way is a very warming one - it's a great pleasure to be able to offer this book! 64 pages, 8 1/2" x 11", 2000. Now with updated paperback binding!! This classic curriculum guide is now published in a standard paperback binding with a matte finish for extra durability. In it, you will find the most creative, energetic, enthusiastic, wise and do-able lesson plan suggestions for each and every letter! 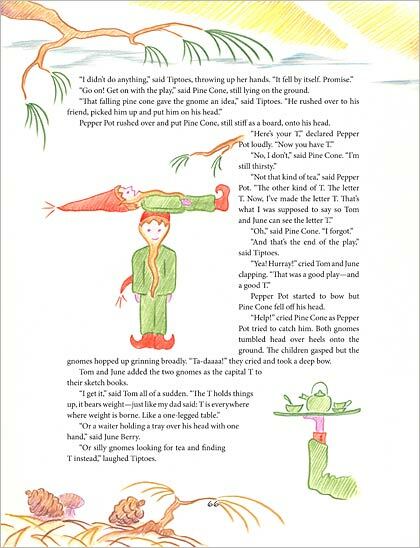 the author suggests a story for each letter that relates to the images in LMNOP; he goes on to suggest a delightful list of activities that build a variety of skills; and then explains how to draw a main lesson book figure for each letter, one that captures the heart of the picture in LMNOP but keeps it simple enough for a child to follow successfully. As a manual for LMNOP, Working with LMNOP is exactly what any parent or teacher would want; as an example of what lessons in a Waldorf school can really be all about, it is sheer brilliance. This book is so good and so useful that in itself it is a seed for the future, well beyond just teaching the alphabet and reading. Thank you, Howard Schrager! LMNOP and All the Letters from A to Z comes alive in an entirely new way through these art cards. Each card is a full-size reproduction of the painting (on the one side) and poem (on the other side) for each letter of the alphabet, exactly as they appear in the book LMNOP. There are so many things that a teacher or parent can do with them to help teach (of course), but also to gift the child(ren) with visual beauty and the joyous sound of the English language. as art to display on classroom or bedroom walls. 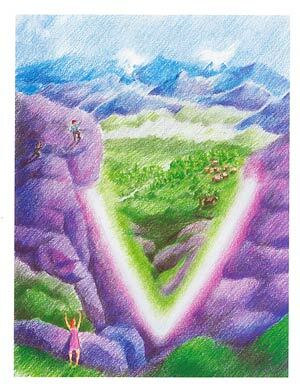 I'm sure you can discover even more ways these cards can make learning and life a joy for the child(ren) in your life. In the realm of "learning tools," these beautiful art cards stand out as something joyous and fully human. We are very grateful for their creation. Thats how you spell Chicago! Howard Schrager's Riddle Rhymes are back with this new collection of riddles encompassing sixty-three United States cities. 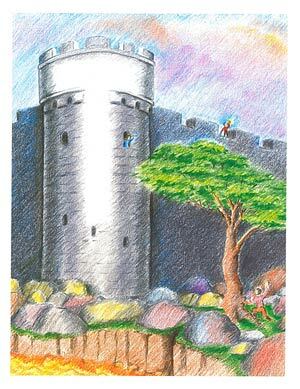 Places we all know and love are accompanied by an engaging illustration and the fun of trying to solve the riddle. As with his previous riddle rhyme books, the phrase in each clue "suggests" the city name, as in the title where Chi(cken), Ca(r) and Go suggest Chicago. Each puzzle is a fun journey enjoyed by adults and children alike. Best read aloud, and in a group! Highly recommended! The sequel to A Knife and A Fork and A Bottle and a Cork (the 50 states), Chicken in the Car and the Car Can't Go, That's How You Spell CHICAGO treats 63 major American cities with Riddle Rhymes. Just because they're fun, people of all ages can vie with each other to solve the riddles in friendly competition that stimulates an interest in language, promotes active listening, cultivates a taste for geography, and provides insights into the human thought process. City Sketches in the back of the book provide information on how each of the cities developed into what it is today. 102 pages, 7" x 8 1/2", 2014. Howard Schrager, author of LMNOP and all the Letters from A to Z, brings us another delight for classroom, home, travel, or just about anywhere you find yourself with a little time and a wish for something fun to do with someone else. A Knife and a Fork... is a collection of riddle rhymes each of which leads to the spelling of the name of a US state. They can become a delightful part of geography lessons, sparking infectious laughter as they stimulate creative thinking and correct spelling. In these original riddle rhymes, Schrager often goes in several directions at once, leading and misleading all at the same time. For instance, in the title rhyme, the first three clues all point to the shapes of letters (N, K and Y), but the final clue is a hint of the spelling of the word itself (...ork). Altogether, it adds up to New York, but the mental journey to getting there just woke everyone up and created an adventure that will make not only the spelling of the word unforgettable, but will bring a smile everytime you hear it, too. Howard will be coming out with more riddle rhyme books in the near future. For now, we welcome you and your students and children and grandparents and friends to a new world of word games that will have you all laughing and spelling away. Very highly recommended. 58 pages, 7" x 8 1/2", 2010. Sometimes when I pick up a new book, I can tell before I even open the cover that there is something magical about it, something exciting and wonderful. I experience a nearly physical electric thrill that runs from my hand to my heart that has proven over the years to be the harbinger of glorious things in print. I had this experience when The Waldorf Book of Poetry arrived - and as I have poured through its more than 325 pages, my joy at what this book contains has grown by leaps and bounds. Here, in one place, is one of the greatest collections of poetry ever brought together. The love that has gone into the selecting this anthology is evident on every page. There isn't a single great poem I've thought of that I haven't found inside the covers of this book. There are classics, modern poems and some of the "old favorites" written especially for Waldorf schools. In addition, the design of the book is meant for years of use, with a sturdy hard cover and bond paper. It's organization is gifted, leaving anyone who even glances at the table of contents hungry to read more. Even the typesetting is wonderful: crisp and clear as books so often are not these days. In addition to the hundreds of beautiful, engaging poems to share with students of all ages, there is a Foreword by Eugene Schwartz that anyone who is teaching children will love. Here Eugene shares his classroom experience and methods of using poems such as these. For those teaching at home, or who are new to the classroom, this foreword is a gift that makes The Waldorf Book of Poetry into a resource not just to be loved, but also used. This is the book that will feed the hearts and minds of children for years to come. Many thanks are due David Kennedy for bringing it to life. Lovely and refreshing! To give your children the gift of these animal poems -- whimsical, lyric, silly, or profound -- is to give them a little piece of magic they will carry for a lifetime. Whether you are teaching in a classroom or raising children at home, keep a copy of The Waldorf Book of Animal Poetry nearby, so that you can call upon it through the years, and thereby gift the children in your care with beauty and insight, laughter and compassion, understanding and wonder at the myriad nature of the animals around us. Celebrate and honor our furred, feathered, and finned friends with the world's largest collection of animal poetry ever published. The Waldorf Book of Animal Poetry brings the animals of the forests, mountains, jungles, deserts, rivers, seas, and even your own backyard to life on every page. It is truly an essential companion for teachers and parents at every level from kindergarten to college. Parents, children, and animal lovers alike will discover old favorites, make new friends, and revel in over 425 animal poems by classic and modern authors. A not-to-be-missed treasure alongside it's companion volume, The Waldorf Book of Poetry. I can't begin to describe how much I love this story and the fact that Shelley Davidow has so much insight and such an understanding of children that she created it. The Wise Enchanter actually makes me wish that I could go back to the time before I learned to read and enter the magic world of words through this rich and wonderful door. I especially love that the story is so very like the worlds I created for myself in those pre-written-word days, yet carries with it the assurance that there are depths of goodness in the world and that searching for them is a worthy, yea, necessary thing to do. What could be a better way to introduce our written language to a child? This book is a beautiful creation and a gift to treasure. Gadrun ran to her father. A frown creased her brow. "Dear father," she said, "I see that you are worried." "I am getting old," he replied. "Without Wisdom, there can be no new Enchanters after I am gone. No children have come to my island for many years. It is happening just as I feared. Wisdom is fading in the world. Words are disappearing. The brightness in the sky is vanishing and the dark Cloud of Ignorance has grown suddenly dense. A new darkness is looming. Someone is being created in the deep. He is growing stronger every minute. If he is not stopped, he will grow immense. If he grows strong enough, he will rise up and devour every word and sound. The earth will become a cold, silent place, too terrible to imagine." "Who are you talking about?" Gadrun whispered. "I do not like to utter his name," her father whispered. "But I will say it for you. His name is the Master of Ignorance and Shadows. His name is Urckl!" Gadrun grew pale and silent at the mention of Urckl. Once, some time ago, Urckl had found enough strength to send one of his messengers to the end of the world. Something terrible had happened then in the Enchanted Islands and Gadrun's heart had been broken. And thus, the adventure begins. I should add that The Wise Enchanter is filled with soft black-and-white drawings that you can easily transform into main lesson drawings for the child(ren) you are teaching to recreate as each letter is rescued from darkness. This is a wonderful, vibrant, masterful book -- may your journey through it be rich and rewarding! This handbook describes a revolutionary way of delivering primary education. In a storytelling school all children learn to be storytellers, retelling and improving stories from memory as a way of learning both language and subject content across the curriculum. Children graduate with a repertoire of their own stories to tell. This approach has been shown to raise standards and fire imaginations in schools throughout the UK. The Storytelling Schools approach has had a transforming effect on our approach to literacy and the teaching of writing. In a relatively short time the impact on writing outcomes, pupil motivation and teacher expertise has been profound – it’s an approach that every school leader will want to know more about. Storytelling, taken as seriously as this, delights pupils and teachers alike and provides a foundation for the most remarkable growth in pupil confidence and competence in writing. All the evidence I have seen is that it also extends the skills of teachers. In England, a group of innovative educators created the idea of Storytelling Schools, primary schools where storytelling is the key way that children learn. By which is not meant only learning to listen to stories, but to actually learn the stories by heart, learn to retell them, learn how to adapt and change them, and finally learn to reassemble different elements from different stories as an entirely new story. In the course of all this, these children find sure footing in language skills, organizing their thoughts, clear communication, and develop not only the self confidence that comes from really truly learning something, but they also learn the foundations of learning and thinking themselves. Over a period of ten years, Storytelling Schools throughout Great Britain have become a revolutionary way of delivering primary education. In a storytelling school retelling and improving stories from memory is a way of learning both language and subject content across the curriculum. Children graduate with a repertoire of their own stories to tell. This approach has been shown to raise standards and fire imaginations in schools throughout the UK, and it can do the same for any children you teach. 147 Traditional Stories for Primary School Children to Retell was written and compiled as a comprehensive reference for teachers in search of stories to teach their class. The stories range from very simple tales for first graders all the way to long, complex stories for students in Grade 6. Altogether, the collection is rich and masterful. 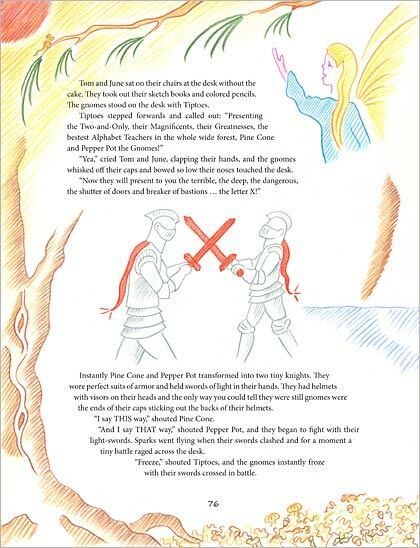 Included here is an introduction that gives concise and meaningful guidance for using these stories to teach students the art of storytelling. Additionally, the Introduction is simply inspiring: any teacher reading it will find him- or herself energized and empowered to carry out this approach to education itself. Personally, I think that this method is a 'next step' that would enhance and focus Waldorf education for the modern world. I can't think of a better addition to Steiner's curriculum than incorporating this active element into it. When children are taught to do what the see and admire adults doing, they are drawn away from media-centric, advertising-ridden elements in our culture and toward wholesome creativity and confidence-of-place in the world. In short, children become too interested and too busy with the joy of what they learn to feel much like bothering with something less. The invention of Storytelling Schools was an act of educational brilliance - I only hope that they and their impulse continue to thrive and that teachers everywhere in in every sort of school incorporate this method into their classes. Recommended without reservation and with much hope! Includes essay by William Ward, "Learning to Read & Write in Waldorf Schools"
The Waldorf Alphabet is a wonderful lap book - a lively exploration of sound and meaning for parents and children to share and love. The colorful, eloquent paintings depict the form of the capital letters of the English alphabet in ways that are brimming with life. Surrounding these pictures are a series of objects with names that begin with the letter being revealed. On the opposite side is an image of the capital letter itself, with the lower case letter in each corner. The question, How many things beginning with *the letter* can you find? is at the bottom of each facing page. My experience of these pictures is that each picture makes me want to jump right into it so that I can participate in the story. Imagine the possibilities for stories and conversations with young children! I believe that this book offers a heart-path into the world of the written word - and a warm sharing between parents and children. What better gift than this? When I saw A Farmer's Alphabet, I knew it was a perfect addition to the 3rd Grade Farming/House Building block in the Waldorf curriculum. The feel of these images is so authentic (I grew up on a farm, so I can attest to this), so warm and alive, that having this book available can enrich the student's experience enormously. Many 3rd Grades use Laura Ingles Wilder's Farmer Boy as their focus -- A Farmer's Alphabet practically illustrates the story: a New England farm with work still being done with simple tools. A bonus is that the alphabet also shows both upper and lower case printed letters that in 3rd grade, when students are reading from printed books as well as writing their own main lesson books, becomes a lovely visual reinforcement. The poems in this collection were written originally as birthday verses for children between the ages of seven and eleven. The children, each having been given a verse, would learn it by heart and recite it to the class on their birthdays. After more than sixteen years of teaching children at the Hereford Steiner Academy, the author reviewed the verses he had written, and it seemed many could be enjoyed as poems in their own right, though they also made a satisfying collection, as they often follow the seasonal cycle. Teachers and parents may find continuing use for them in recitation and storytelling, to accompany movement, or as inspiration for their own verses. These poems will evoke smiles and fond memories for all those who take them to heart. Michael Rose makes the case that the very life and nature of language are breaking down under the pressures of modern society. I couldn't agree with him more -- I hope many people will read his book and be inspired in a thousand ways to make changes to reverse the slippery slope of this trend. In Living Literacy, he attributes these threats to inappropriate electronic media and to fundamental flaws in modern educational systems, while examining what really works in teaching and preparing for literacy. Living Literacy investigates the nature of literacy and how it relates to child development. It explores how teachers and parents can prepare for the transition to literacy through conversation, story, song, and play, followed by relevant and living ways to introduce reading and writing formally. An outstanding resource for class and remedial education teachers, speech therapists, homeschooling parents and ESL teachers! Here we have hundreds of rhymes, each of which concentrates on one specific sound. When repeated as an exercise, they train the mouth to form the sound correctly. Or, use them as a creative way to expand vocabulary or to learn to correctly spell words that sound similarly. The first part of the book describes how speech sounds are produced and illustrates consonant and vowel positions. The wide range of rhymes and verses means it is suitable for both children and adults, including those learning English as a foreign language. Mary Nash-Wortham has extensive as a Speech and Language Therapist. She is co-author along with eurythmist Jean Hunt of Take Time, widely used in remedial and extra lesson settings for children with learning difficulties. What pleasure awaits those who not only dip into this book at random, but who also search for the particular poem or verse which has personal meaning. What a gift for the family—and how wonderful to think of a new book growing with the family and being passed on, thoroughly finger-smudged, tear-stained and page turned. Matthew Barton has gifted us with the most sensitively gathered collection of verse available in print. With poems for children from toddlers to teenagers, The Winding Road has beautiful verse for all interests, ages, and situations. You simply can't do better than to have a copy of this book at hand, ready for you to dip into when looking for "just the right poem" to share with your child -- I promise you, you'll find it. Barbara Dawson Betteridge was someone whose friendship Bob and I were grateful to have, and who offered that same warm generousity to Highland Hall and the all of Waldorf education. Since 1953 she was one of those amazing souls without whom no Waldorf school could survive for long -- her warmth, insight, and creativity were always at the disposal of any teacher who needed them, any parent with a question. And, it was over the ensuing 50 years that Barbara wrote the songs, poems, and plays that you'll find in this book which were gifts from her to Highland Hall and are now gifts to the entire Waldorf Movement. Just a glance through the book, and you'll know you're in the hands of a master. Be prepared to discover some of the best material for children that has ever been set to paper. And clove it in twain. And thrust upward to heaven. A collection of original material written by master class teacher Dorothy Harrer for her own classes at the Rudolf Steiner School in New York. Verses and Poems and Stories to Tell is rich with delightful tales and rhymes to keep children engaged for hours and during chores, walks, and play. For parents and teachers this offers a treasury of ideas and story-lines to carry through many days and bedtime rituals with children! With a deep compassion for a child’s need to hear beautiful words and inspiring stories that give a new excitement to ordinary daily routines or things in nature, the author provides glimpses into how to turn the daily routines of life into fun! Particularly suited for grades 1-4. This edition replaces the spiral-bound version of Verses and Poems and Stories to Tell. The Rime of the Ancient Mariner is one of the great classics of English Literature, considered by many to be the greatest ballad ever written in English. Composed at the end of the eighteenth century by Coleridge, its unique qualities have continued to capture the imagination of readers and artists throughout the ages. Readers, particularly high school students, respond with awe to the power of the super-reality in the poem, seeing through the mariner's eyes the vast expanses of ocean and the elements. It's expression of human suffering and the difficult journey toward harmonizing our inner extremes speaks as well to the hearts of adolescents and young adults especially. The creation of the 30 illustrations in this book by Sophia Montefiore was impelled by an abiding fascination with Coleridge’s perspectives into the world of the soul and the elemental powers of nature. These authors give us all an antidote to the decline in cultural literacy and general "dumbing down" that has been noted in all education: namely, they help us to remember how very much we love literature and everything about it. This is a book that can help parents and teachers pass along a love of literature to the students they teach -- and in so doing, it can help uplift the world we live in. Here is a fascinating journey through the English language and its literature, born of John Wulsin's lifelong interest “how sound works in English and American poetry.” Wulsin traces the many changes, both subtle and radical, in how English has sounded over the past thirteen centuries, while also showing how those changes are related to the evolution of human consciousness in Western, English-speaking peoples. The Spirit of the English Language is never dry but filled with the textures of the lives and works of the great English-language poets. Wulsin describes the evolving activity of poetry in the biography of each poet, beginning with the Old Anglo–Saxon in Beowulf and the later works of Chaucer, and following the spirit of the English language through to the nineteenth century’s “primal/modern” language of Gerard Manley Hopkins and Dickinson’s diamond-distilled language. Along the way, we discover how the very sounds of English have changed the ways in which not only poets think and express themselves, but, more important, how sound works and changes our human consciousness. The author also discusses specifically how, in teaching poetics, stages of the developing English language quicken corresponding stages of thinking in maturing adolescents. Twelve years in the making, The Spirit of the English Language is the fruit of John Wulsin’s thirty years of teaching language and literature to adolescents. The book is further informed and fructified by the author’s fifteen years of teaching poetics to adults, as well as decades of writing poetry and participating in numerous poetry workshops. This practical guide will become a classic for all poets, teachers of poetry and language, and students. It is a beautiful resource for anyone interested in English, its development, its effects on consciousness, and how sound works in poetry. This is an exciting, new approach to awakening spontaneous, wholesome creativity - whether in our selves or within the children we teach. I have a feeling that as more teachers experiment with bringing these exercises into their classrooms, Sing Me the Creation will become one of the most treasured teacher resources ever. Beautiful! In over 300 silly and serious exercises, Paul Matthews gives us permission to indulge our fantasy, and then, when that life is flowing, provides the tools to craft it into poetry and story. Though these exercises are intended for group work with adults, teachers of children will find here many new ideas for the classroom, and individuals working alone will have no difficulty adapting them to their needs. Words in Place is a nine-week writing course that follows a path through the realms of nature, from mineral to plants, animal, and people. By exploring the qualities of each, Words in Place encourages the writer to find a unique, authentic voice and to forge a new relationship the inner and outer worlds. Paul Matthews offers a rich variety of creative techniques and exercises, including "haiku hikes," word and story games, written conversation, collaborative writing, and "tiny tales." The reader will enjoy this powerful and unusual book both for its help in connecting with nature and for its insights into imagination and the poets and writers who created the literary geography of East Sussex, the author’s home.